Juliana had a sweet party at a petting zoo for her 5th birthday. Her mom, Kelly really didn’t want to do a cowgirl or a farm theme, so we created this cute invitation with lots of farm animals and a lovely photo of the birthday girl herself. I hope your party was lots of fun Juliana, happy birthday! 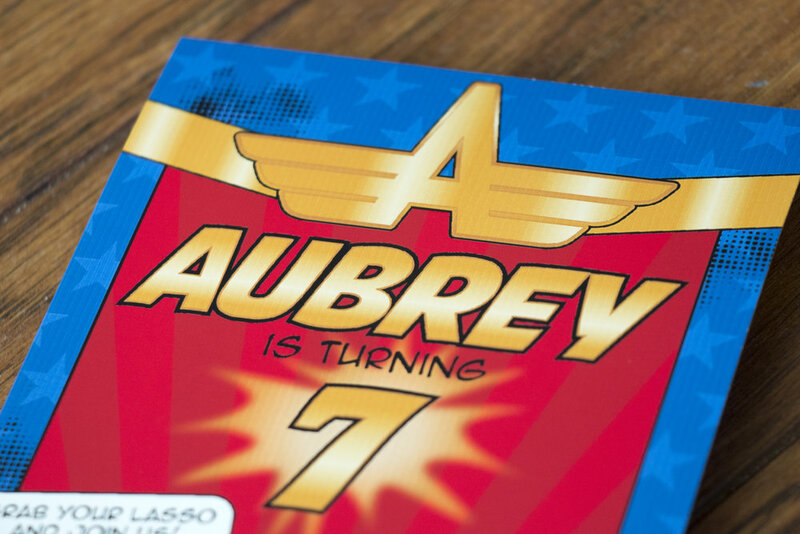 When Jamie was planning her daughter’s 7th birthday party, she wanted a Wonder Woman theme, but Jamie wasn’t in love with the designs she was seeing at her local party store. 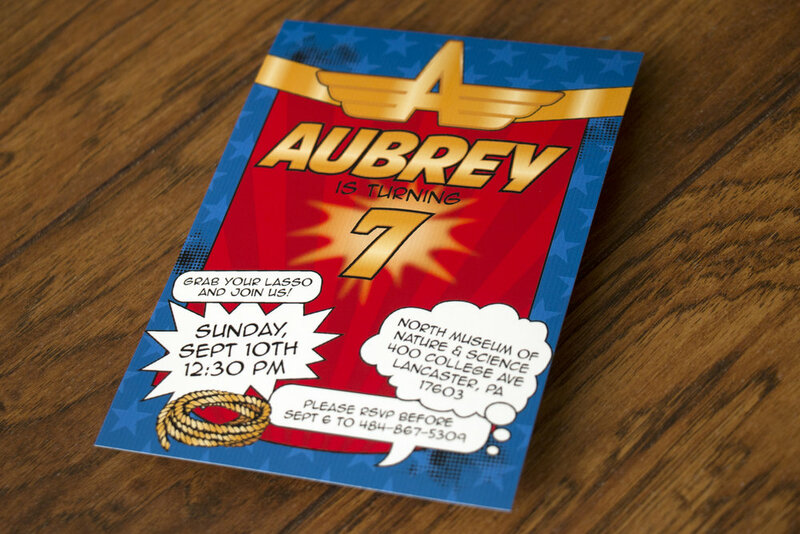 She and I chatted about custom options, but I don’t have a license to use logos and artwork from Wonder Woman, so we created this Wonder Woman-inspired birthday invitation with a comic book vibe and I really love how it turned out! 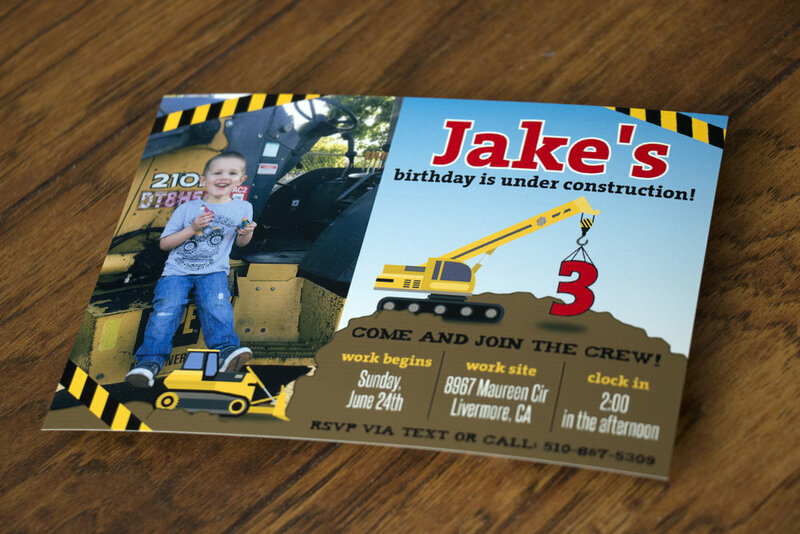 Big boy Jake had an awesome construction-themed party for his 3rd birthday. 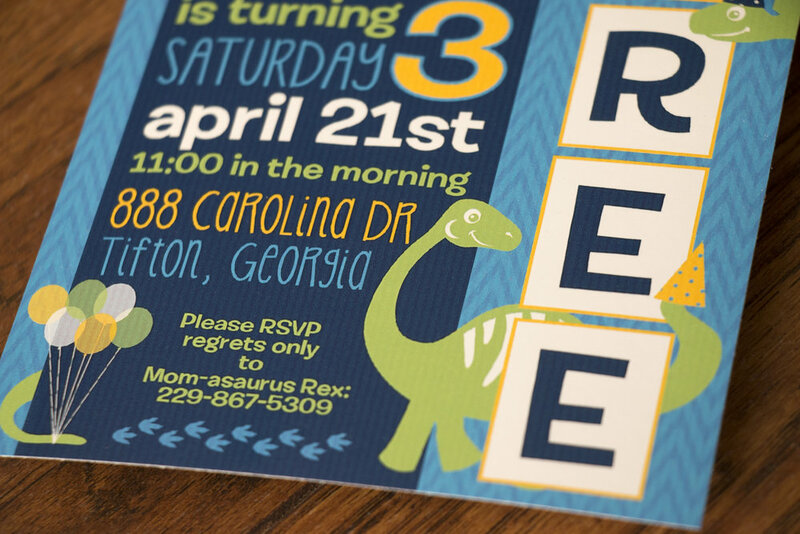 His mommy, Kelly and I created these fun invitations for the big day. I hope you had a great party Jake!! Happy birthday! 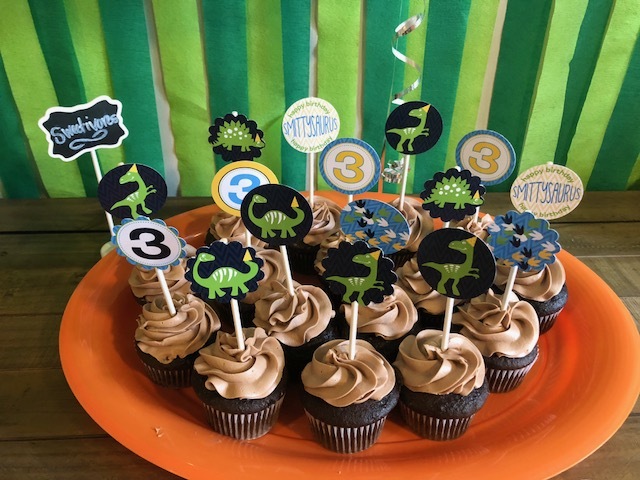 When Ethan turned one, his mommy Jessica wanted to do a fun woodland theme for his party. 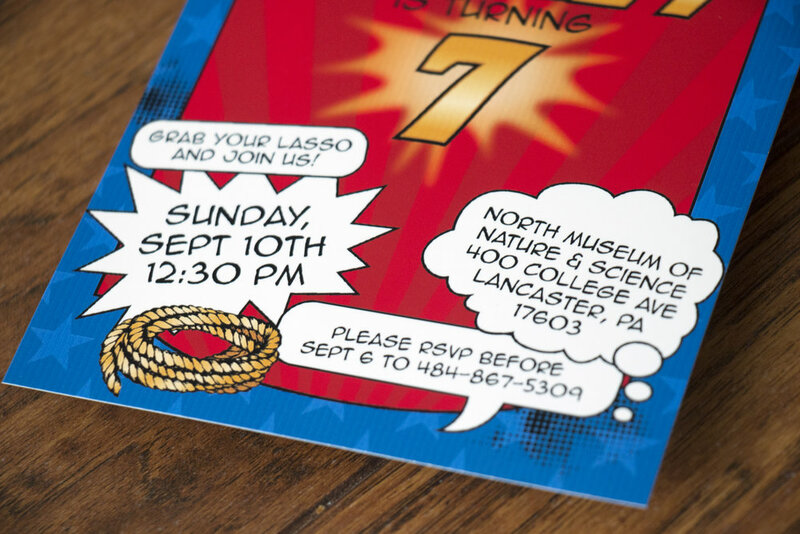 The invitation I created had a faux wood grain background and some pretty cute animals if I do say so myself. Check it out! The little orange fox is my favorite! Katie's mom, Angie and I brainstormed some theme ideas for her 7th birthday party. Katie wasn't really set on a specific theme so it was up to us. Katie loves a group of books titled Groovy Joe, so we decided on a disco dance party. While I couldn't actually use images of Groovy Joe himself, I did use a pretty groovy pink disco ball and we had fun with the graphics. Address and rsvp info changed to protect privacy. Of course, AFTER these were printed, we realized we should have called Angie "DJ Spin Master Ang" or something equally hilarious. 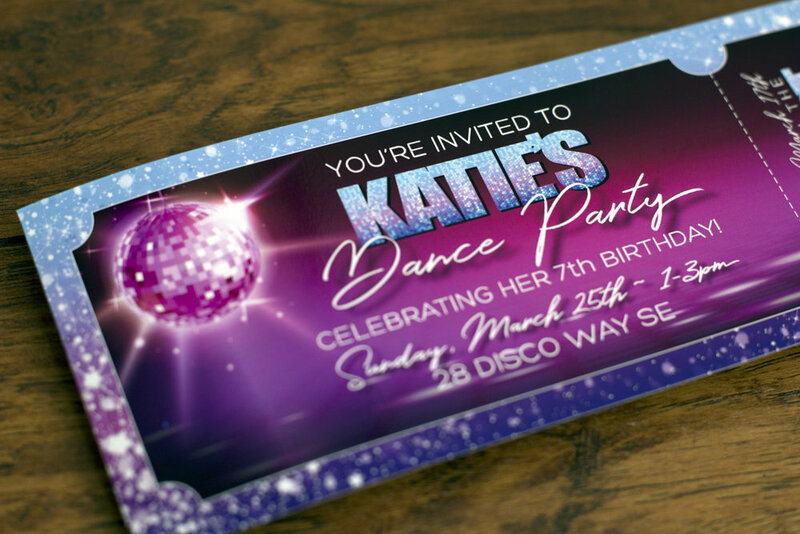 As a fun party favor, Angie made these VIP passes for all of Katie's guests to wear. I LOVE how they turned out. I may or may not have been wearing this VIP pass around my house the other day. Happy, happy birthday Katie! I hope you disco dance party was a blast!! XOXO! 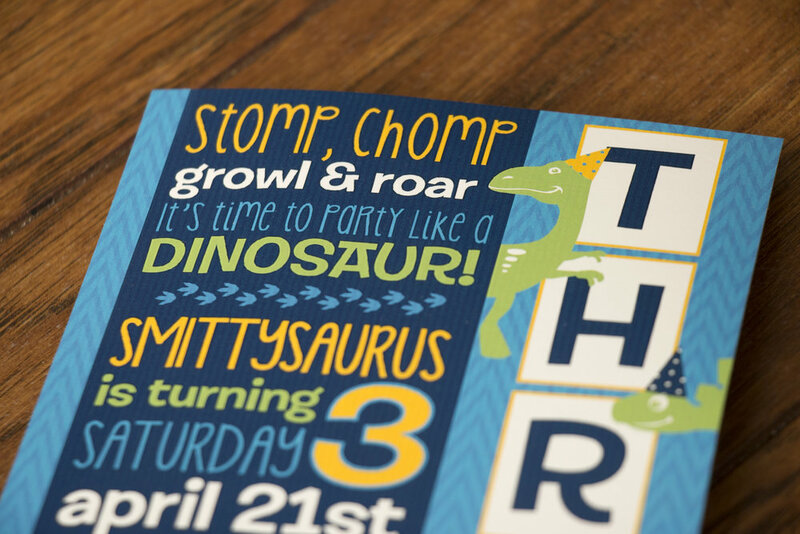 I was thrilled when Jen asked me to create an invitation for Alice's first birthday, everyone calls her Allie Mae. 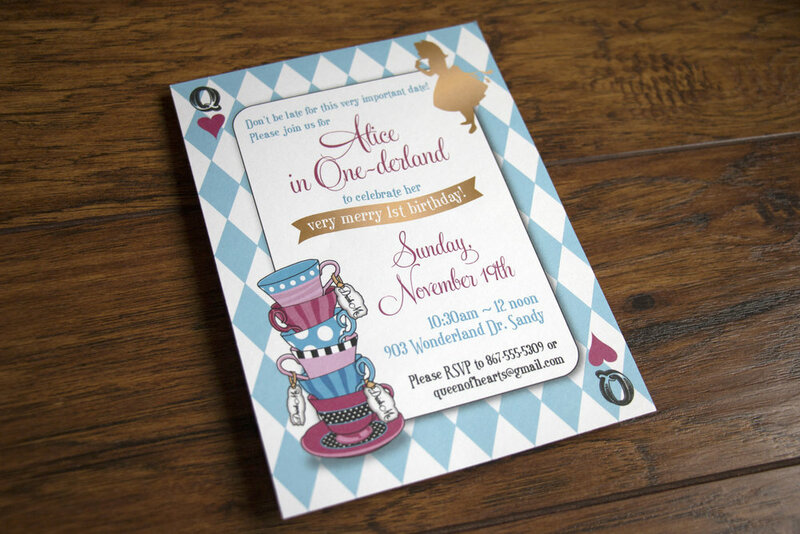 She was having an Alice in Wonderland themed party and it was so much fun to work on graphics for her big day. At the party, Jen set up plain donuts and lots of glazes and toppings so everyone could decorate their own. It was SO much fun, my boys had a blast decorating their own. Jen made Mad Hatter hats for eveyrone with plastic headbands and paper cups. They turned out SO fun! It was such a fun party, thanks you so much for inviting us Jen, and happy birthday Allie Mae! For her second birthday, Julianna's mommy JoAnna wanted to do an ice cream party. 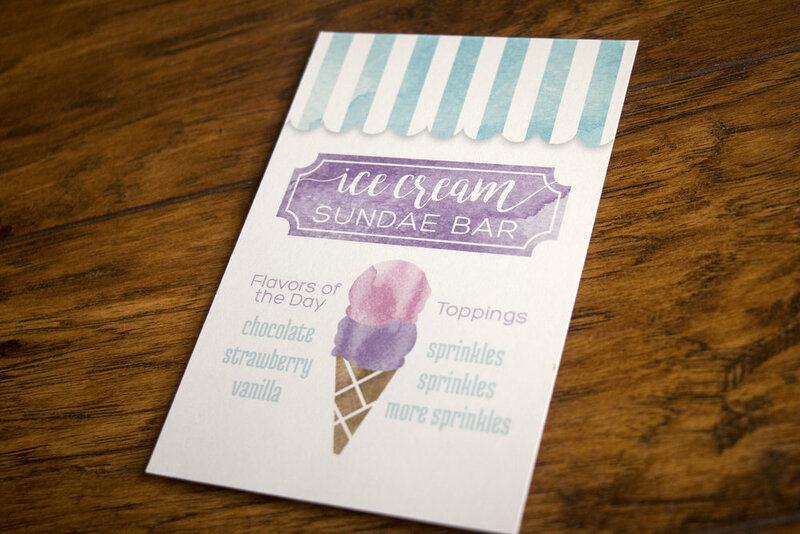 So we had fun with some watercolor textures for her invitation and the other items she had printed for the party. I love how it all turned out! And an ice cream sundae sign. Lastly JoAnna had a big backdrop printed for the big day.